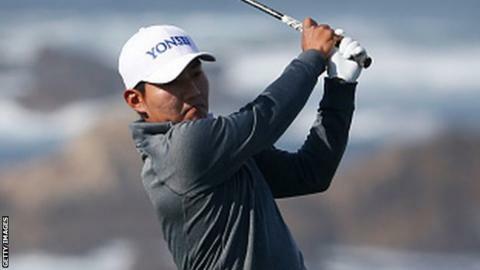 South Korea's Sung Kang carded a course record 60 at Monterey Country Club to share the clubhouse lead at the halfway stage of the Pebble Beach Pro-Am. The world number 306, who shot a level-par 72 on day one at Spyglass in the three-course event, had nine birdies and an eagle to reach 11 under par. Japan's Hiroshi Iwata had a six-under 66 at Pebble Beach to tie for the lead. Four-time winner Phil Mickelson is one back after five birdies and an eagle in his first 10 holes in a six-under 65. "I thought I was going to shoot a lot lower than I did," said the 45-year-old American who has won five majors. "I didn't expect to play one over [par] coming in but I'm not going to complain because I made a lot of good putts on the front [nine]." England's Justin Rose also played at Monterey and is a further shot behind Mickelson on nine under after a 68. Sung, who has a best finish of third in his 57 PGA Tour events, holed from eight feet to par the ninth, his final hole. He needed a birdie to become only the seventh player to shoot a 59 on the PGA Tour but hit his "worst shot of the day" off the tee on the par-three hole, missing the green. "I got a break in the rough," he said. "My career [low] round was 61 a couple of times so I was like, this is good. If the putt goes in, it goes in. If it doesn't, it doesn't. I don't really care. "I holed almost all my putts inside 15 feet." World number one Jordan Spieth did not drop a shot but made only two birdies in a 69 at Monterey and is three under for the tournament. "I drove the ball spectacularly, I just couldn't get it in the hole," said the 22-year-old Masters and US Open champion. "I've struggled putting here at Monterey in the past few years. They're the hardest greens to putt because they are the softest. Speed control needs to improve to have a chance for these putts to drop." Actor Mark Wahlberg, partnering former Masters champion and fellow left-hander Bubba Watson, came within an inch of a hole in one at Monterey in the $7m (£4.8m) PGA Tour event, where celebrities including Clint Eastwood and Justin Timberlake play alongside the world's top golfers. Each team plays three rounds on the three different courses, with the leading 25 pro-am teams and 60 professionals returning for the final round at Pebble Beach on Sunday.